Kromek design and make radiation detectors using a crystal called cadmium zinc telluride (CZT). The detectors can measure the amount and type of radiation in an area or being emitted by an object. This information can then be processed and analysed by computer. In medicine, the radiation detectors are used with gamma and X-ray machines to develop an image of internal organs and see what is happening in the body. They can also be used to measure bone density which is important in diagnosing osteoporosis in older people. For security, the detectors are small enough that they can be worn by security officers as they go about their normal duties. Using a smart phone app, the detectors allow a ‘map’ of radiation to be drawn in real-time. If the levels of radiation go above background radiation, then the detectors let the officer know what the radiation is, and whether it is a threat. Kromek detectors are also being used to scan and identify potentially explosive liquids at airports. The detector compares the results of each scan with a database of known compounds (e.g. 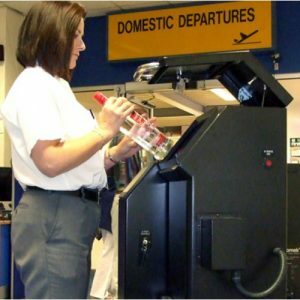 duty free alcohol, baby food, explosives) to identify liquids which you would not want someone to take on a plane! Kromek need a range of different roles to design, build, test and sell their detectors. Some staff have PhDs in physics and materials science, but that isn’t necessary to work in a technology company.